I'm very excited and happy to be bringing you the penultimate blog post in the Maai Design blog tour. Maaike is a Belgian born Sydney-sider who, through her online shop, Maai Design is bringing some of the most divine fabrics into Australia. Maai Design also stocks matching ribbings, piping, zippers and the paper patterns from Compagnie M.
When Maaike invited me to join the Blog Tour I knew I just had to sew up my fabrics that I'd petted, washed, dried, petted some more and then put away. I'll talk more about the patterns I used and the successes and failings of my sewing in other posts to follow this one. Suffice to say I liked these fabrics so much that I sewed muslins of (almost) every garment in something cheap and nasty first. For me to sew a practice run, well that is a real measure of how special a fabric is! I love this Beetle fabric for P. It's a gorgeous soft shade of green and is very gender neutral really. But you know, boys and bugs just go together so well! The knit is quite the softest, loveliest feeling stuff, and so I was sorely tempted to use it as lining. 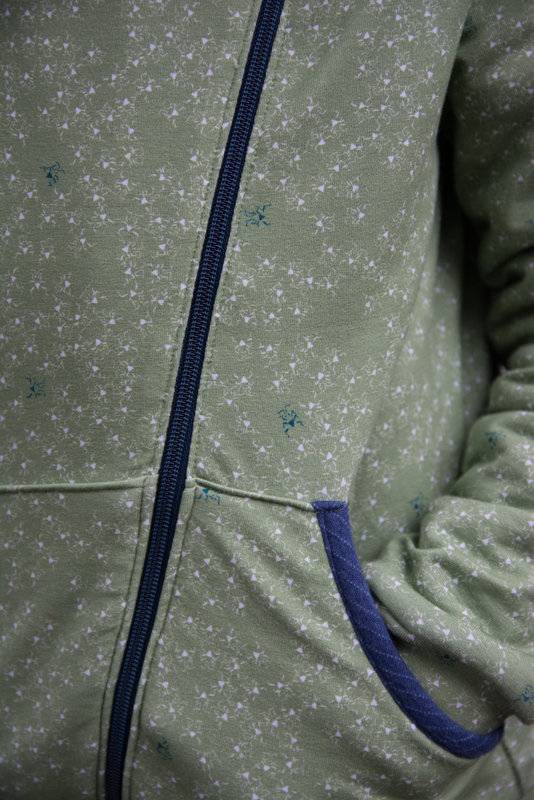 Instead I dug out a soft, brushed knit that highlighted the little blue bugs nicely, interlined the two layers with a layer of polar fleece, and now it is truly, the most snuggly hoodie in the whole world. Both the Froy & Dind and Zonen 09 knits are a cotton elastane, made with GOTS certified organic cotton. They are thick enough, stretchy with great recovery and beautifully printed. None of the print quality is lost when the fabric is stretched, so I was happy to use the main fabric for my bottom band and cuffs. - which meant I got to save my co-ordinating blue ribbing for another day! You know, when you sew for a little girl you go through phases when sewing yet another pink garment might. just. kill. you. This is certainly a bright pink, a kind of hot raspberry pink, if such a shade exists. But look, it's mixed with white and quite a surprising shade of green. And well, I really like it. 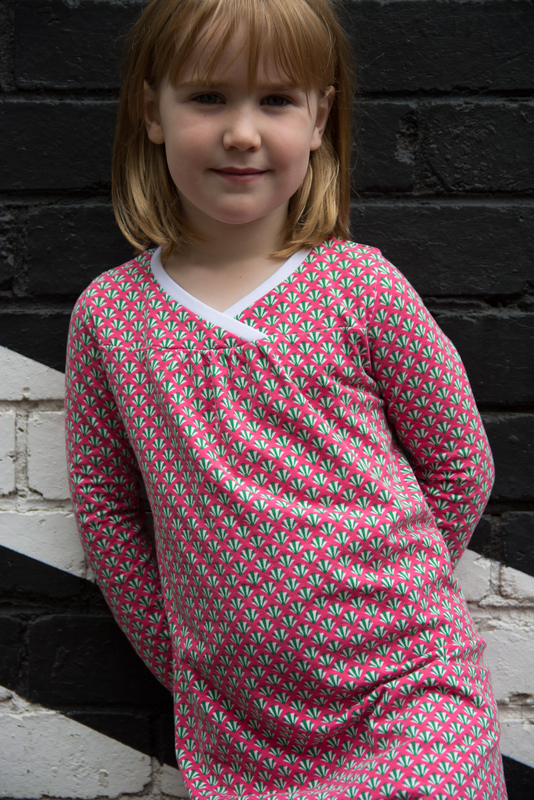 The Froy & Dind knits are extra wide at 160cm, so I have enough leftover for another pink T-shirt when this dress is outgrown! Of course, the bulk of my fabric win was always going to be for me! I had a firm vision for the summer dress I was going to sew myself. It isn't this one, and here it is almost Autumn, but gee I'm happy anyway! 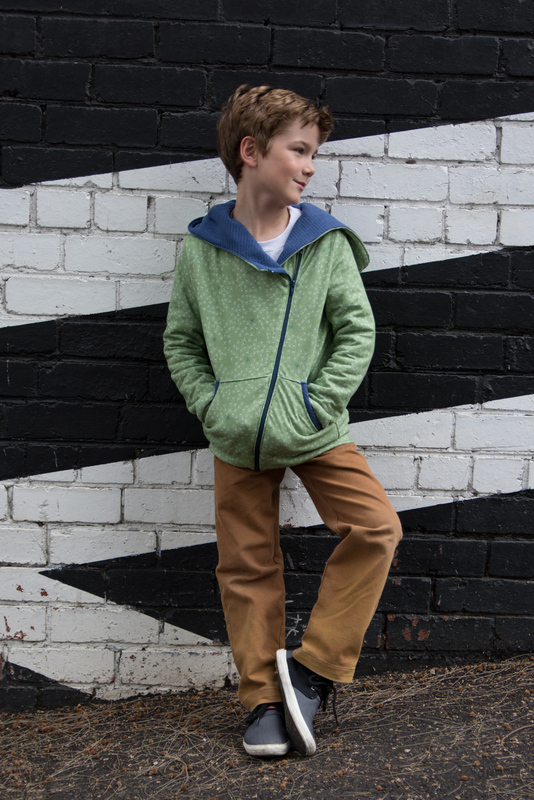 Cotton elastane knits are always going to curl at the edges, so why not just embrace it?! This dress pattern calls for raw edges which I'm afraid I just can't bear to do, so I did a narrow overlocked rolled hem. They still curl quite a bit but the effect is sorta textural - I'm going with that. In a lesser fabric it would feel clingy, lumpy, underwear bulgy and just not good enough. With the exception of the single layer sleeves, most of the dress is two, or even three layers thick and it feels goooood. Soft, thick, stretchy and smooth. Our modelling session may have been helped along by playing Simon Says. One plays, all play. It seems I gotta abide by the rules too. 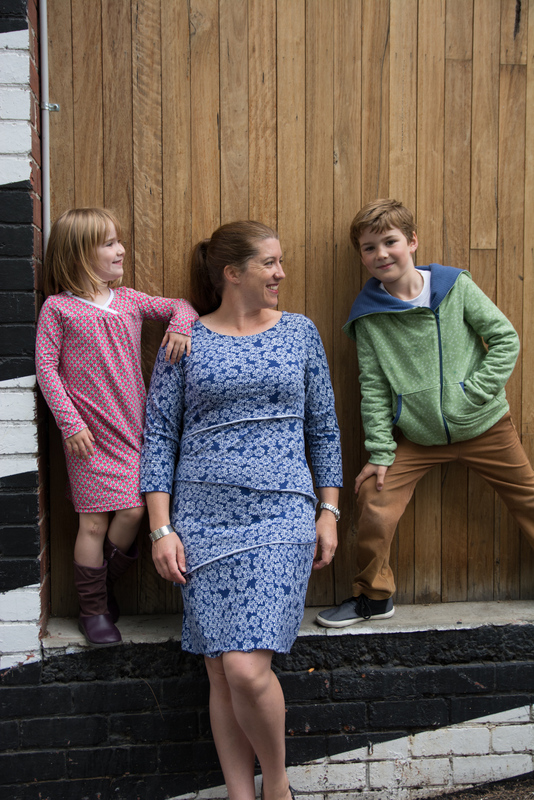 So that's the three of us in our Maai Design knits. I really wish I'd had the time and foresight to get some of this Stickly Rockers woven cotton and make a shirt for Flipper! 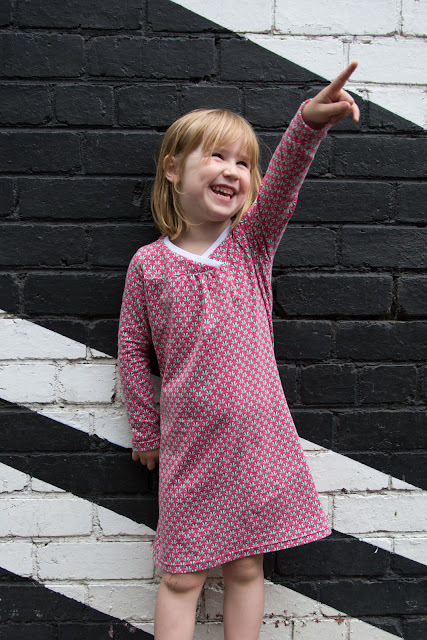 As part of the Blog Tour, Maaike is offering a 10% discount on all fabrics from Maai Design until the 26th March 2016 - just use the code maaidesign10% at the checkout. You can see the introductions to all the tour participants by clicking on the banner image below, or check out the previous posts directly. 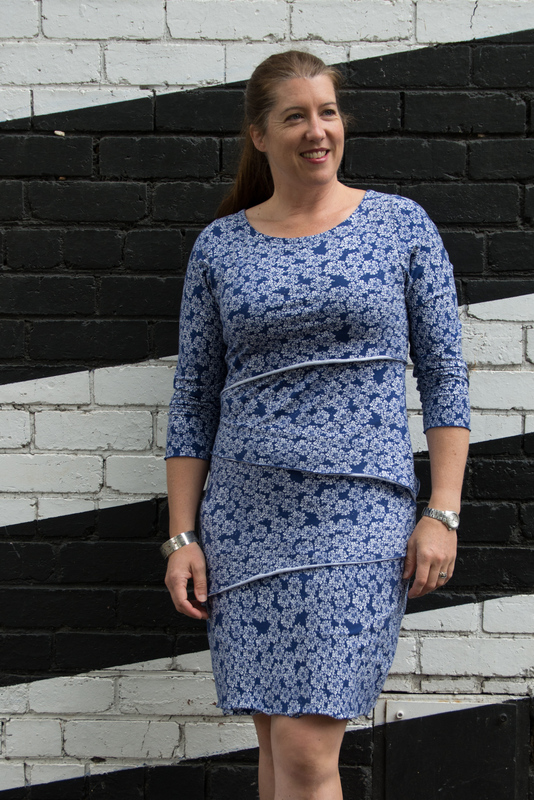 There has been so much fantastic sewing you're bound to be inspired. Now, you've come this far and you're ready to have a bit of this fabric for yourself, right?! Since Maaike was sponsoring the blog tour with discounted fabric for the tour participants and I'd already won and/or purchased mine anyway, I figured I should buy a bit more to give away. Deciding what to buy on your behalf was every bit as hard as choosing for myself! I chose two bundles in the end, and now that I've seen and felt the Soft Cactus cotton I am really wishing I hadn't made a mental pledge to give it away. It is seriously good. Enter via the Gleam widget below. Don't forget to say in a blog post comment whether your preference is for the woven Soft Cactus fabric with piping, or the Froy & Dind knit with ribbing. The first winner selected will get their choice of bundle. The second winner might get what they wanted, or they might just get some fantastic fabric that they can be happy with anyway. Fair?! I've timed my competition to end on Wednesday 23rd March at 10am. That way if you miss out on my giveaway you still have a few days to shop using the blog tour discount code! Thanks to Maaike for having me on the blog tour and introducing me to her beautiful fabrics. I'm hooked. 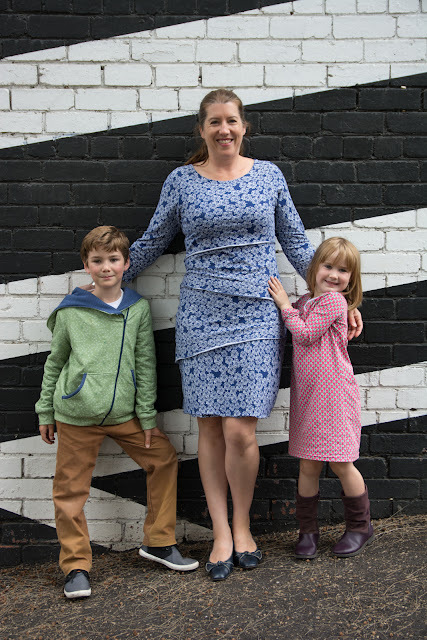 Over the next week I'll post each of our garments in a bit more detail, show you my trial runs and share the trials and tribulations of family blog shoots. Stay tuned. Wow Shelley! You have been busy!! So cool to see the 3 of you together in those gorgeous clothes. I am with you on the "pink dress challenge", I had a lively debate with my daughter yesterday when I let her pick fabric for her next dress! Thank you for the kind words and it's been great having you on the blog tour!! Oh, and really looking forward to finding out which patterns you used!! I really love your dress Shelley. I am very interested in finding out what pattern you used for this - it looks nursing friendly in the design and I just love the style. It suits you really well! Not too casual but would be great for work I should think also. LOVE Maaidesign. I think my preference would be the Soft Cactus but both look gorgeous. 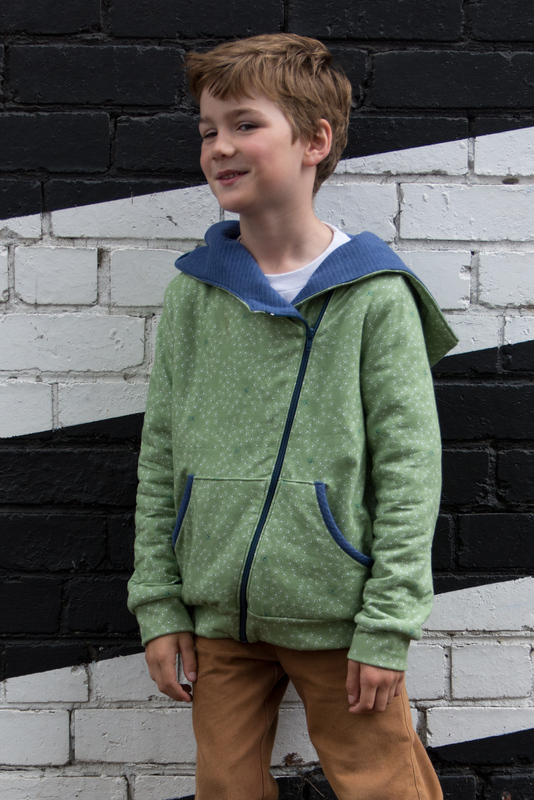 I especially love the hoodie you made your son- great idea to add an inside layer of fleece! this fabric looks amazing and love what you have done with it. Perfect use of lovely fabric. I'd be picking the knit bundle for my winnings. 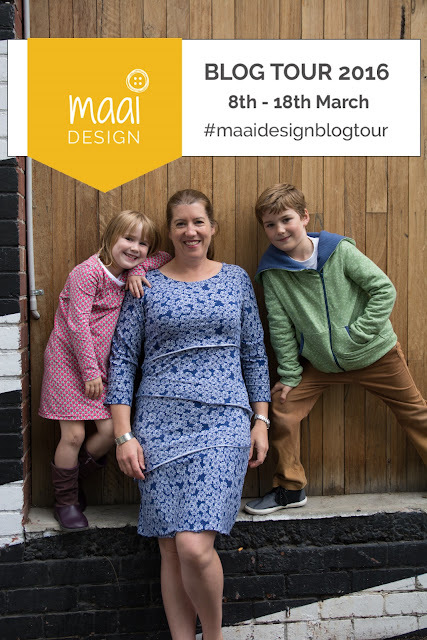 Wow well I have been thoroughly enjoying reading everyone's blog's on the Maai Design Blog Tour. I love sewing and have just found bloglovin where I can immerse myself in everyone's sewing adventures. I am about to purchase a new machine, so for me I think I would love the knit to try on the new machine. But of course I wouldn't mine either. oh ps. I love the Soft cactus but only because i'm still too scared to sew knit! I have been trying to sew around socks for a softie and that is enough to do my head in! Wow, I love everything you made!!! The hoodie looks so comfy cozy that I feel I can almost touch it on my comptuer screen. I think my daughters would love those bugs! And your dress -- oh I cannot wait to hear (erm, read) more about it!!! And those fabrics are just gorgeous. I'm so so sad but a little relieved that Maai doesn't ship outside of Australia -- otherwise I know I would be in real trouble!!! Great post! What great, happy photos. Well done. If you draw me, pick again or keep it! Beautiful work as always, Shelley. Love the layered effect of the dress - what is the pattern? The colours and style of the hoodie are just perfect, and the pink dress is totally my kind of pink! Great giveaway - I would choose the Soft Cactus and piping. Shelley, these knits are all so good! There's nothing like a good knit! And how great to not have to have to order from Finland (I feel your pain!). Also, it's really great to see you together with your kids! These shots are so beautiful. And with everyone in handmades. Only a bonus! Don't worry about entering me in the giveaway, the shipping is not worth it! But I just had to say, you guys look FANTASTIC. I am especially drooling over that hoodie, and can't wait for the more detailed post! Love all your garments and what a great way to showcase the fabric. You all look like you had a great time. Oh and the Soft Cactus Fabric looks divine. I love your creations.....and I'd pick the soft cactus cotton pack. 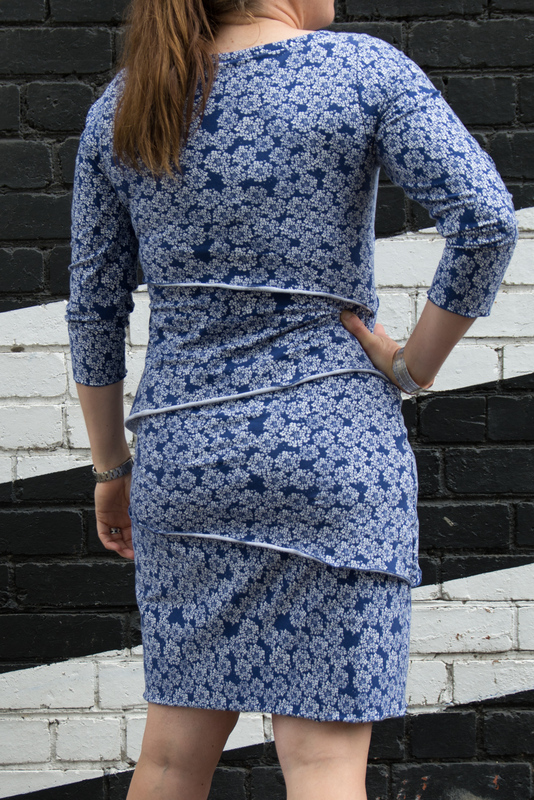 It would probably be made into a dear prudence dress from sewpony because i love that pattern with it's piping. Knit, please! I love the cotton, but I am challenging myself to sew with knit, having already used Maaike's cotton and laminated cotton with great success. 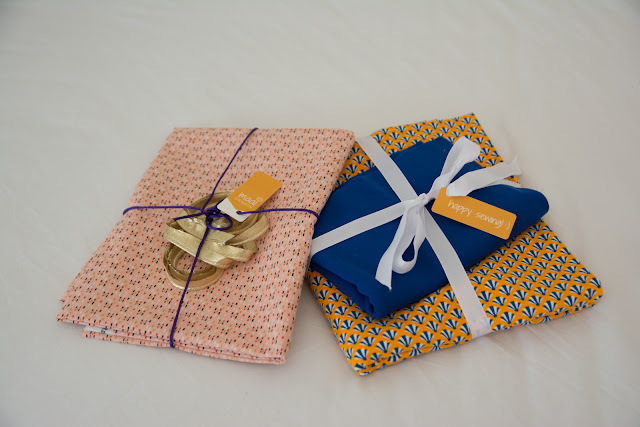 Her fabrics are beautiful, and I have loved seeing what everyone has come up with. Congratulations to Alex (GiddyAnts) and Alyson Ashe - I've contacted you both directly. Thanks to everyone else for coming by!